James Bond recording in Sweden. The film, following the lives of real men around the world named James Bond, begins shooting this week with Sweden’s own James Bond. FOR IMMEDIATE RELEASE: London, January 28thth – Production company The Other Fellow Ltd. today announced that their film The Other Fellow, a documentary about the lives of real men around the world who are named James Bond, is coming to film in Sweden! Birds of the West Indies by author James Bond an American ornithologist. Written by ornithologist James Bond and first published in 1936 by the Academy of Natural Sciences as part of the International Series. It has been reprinted several times since then, including a September 1, 1999 edition from Houghton Mifflin and a March 4, 2002 edition from Collins. The book contains approximately 256 pages. James Bond (January 4, 1900 – February 14, 1989) was a leading American ornithologist whose name was appropriated by writer Ian Fleming for his fictional spy James Bond. The real Bond was born in Philadelphia and worked as an ornithologist at the Academy of Natural Sciences in that city, rising to become curator of birds there. He was an expert in Caribbean birds and wrote the definitive book on the subject: Birds of the West Indies, first published in and, in its fifth edition, still in print. Birds of the West Indies is known not only for its exhaustive study of Caribbean birds, but also for its author, whose namesake became famous as the fictional Agent 007 of Her Majesty’s Secret Service. The name of the book’s author, the ornithologist James Bond, was used by Ian Fleming for the name of his popular British secret agent, Commander James Bond. Fleming, a keen bird watcher while living at his estate in Jamaica, owned the book. He later explained that the author’s name was ”brief, unromantic, Anglo-Saxon, and yet very masculine – just what I needed.” The book has since become a collector’s item amongst Bond fans and was featured as an homage in the twentieth James Bond film, Die Another Day when Bond poses as an ornithologist while in Cuba. James Bond Masquerade party. 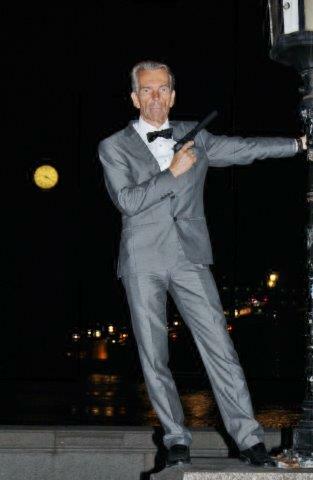 James Bond Museum Nybro Sweden 31/1 kl. 20-24. James Bond Museum Nybro Sweden 31/1 kl. 20-24.